CNN/ORC Poll. July 22-25, 2015. N=1,017 adults nationwide. Margin of error ± 3. ABC News/Washington Post Poll. July 16-19, 2015. N=1,002 adults nationwide. Margin of error ± 3.5. 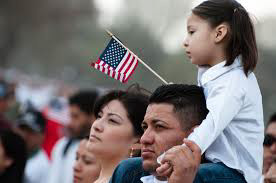 “Do you think undocumented immigrants currently living in the United States should or should not be allowed to live and work here legally if they pay a fine and meet other requirements?” If should be allowed: “Do you think undocumented immigrants who meet the requirements should be able to apply for U.S. citizenship, or be able to apply for permanent residency, but not U.S. citizenship?” Combined responses. Public Religion Research Institute/Religion News Service. June 10-14, 2015. N=1,007 adults nationwide. Margin of error ± 3.6. In the US, we have maybe 1 out of 3 who have some sort of problem with current immigration. This is not unusual. At times, we have been concerned about Catholics, Irish, eastern european, Jewish, and southern european immigrants. There is a nasty strain in American society of people who only want to see people on the streets who look like them. Always has been this segment; they will always be around. Not good, but it is not tragic. It is far from the majority of Americans. McTrump says a nation without border is not a nation. I say that a nation that forgets its immigrant heritage and heaps scorn on those who come here to build a better life for themselves and their family is not a good nation (Yes, Jeb, immigration is an act of love and don’t let them steamroller you on this!). No one should, or could, doubt that we are in fact a country; what much of this talk about immigration makes some of us here and many more of those abroad wonder is if we are a good, fair country. Buck up, we are hearing all about McTrump and his devotees and about Republican voters. What they think is what they think; it is not (and the polls show it) what the majority in this nation think.